is considered the finest 'Glob' in the northern hemisphere, second only to the magnificent Omega Centauri of the south. Discovered by Edmond Halley (comet fame) in 1714 in the Keystone of Hercules, the cluster likely has over 1,000,000 individual stars. Its distance from earth is estimated at 20,000 light-years and the diameter, 160 light-years across. 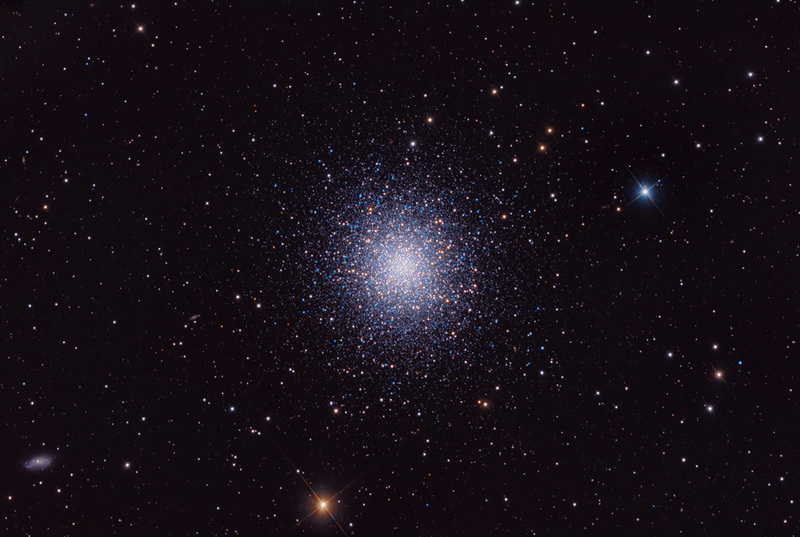 Roughly 100 globular clusters of similar appearance surround our galaxy. They are ancient travelers, billions of years old and comprised of mostly metal-deficient stars near the end of their life. Note galaxy NGC 6207 at bottom left, as well as several other tiny edge-ons in the field.